UNCASVILLE - Don’t tell Jim Calhoun or his former players that UConn is no longer an elite basketball program. 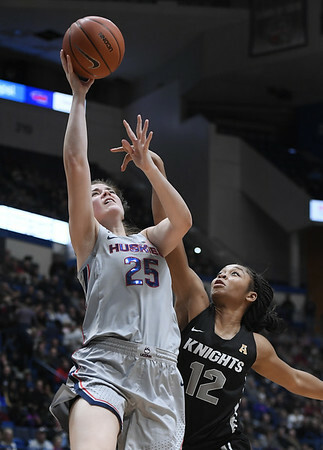 Yes, the Huskies have missed the NCAA Tournament three times in four years and are 30-35 the past two seasons while playing outside a power conference. UConn is under investigation by the NCAA, and has accused former coach Kevin Ollie of recruiting violations, prompting his firing in March and sparking at $10 million contract dispute. But the Hall of Fame coach Calhoun says the program Dan Hurley has inherited remains of championship caliber. The key to doing that will be for Hurley to embrace that past and the family atmosphere that has traditionally surrounded the program, Calhoun said. UConn’s recent problems have had a lot to do with player recruitment, retention and development. The Huskies have landed relatively few top recruits and several players who have come have either left early for the professional ranks (Daniel Hamilton), transferred out (Steven Enoch, Vance Jackson) or been unable to contribute to at the level that had been anticipated because of injury (Alterique Gilbert). Hurley has made a point of convincing current players, including Gilbert and guard Jalen Adams, to stay to create their own chapter in UConn’s storied history. The new coach and several of his players, including Adams and Gilbert, were in the stands Friday night as about 50 former UConn players and coaches returned to honor Calhoun, raise money for charity and relive past glory. The gathering included many of the big names from an era when the Huskies had 13 NBA lottery picks. Ray Allen, Donyell Marshall, Rudy Gay, Richard “Rip” Hamilton, Charlie Villanueva and Jeremy Lamb all played. And while that level of talent may seem like a distant memory to many fans, Allen said he believes Hurley can still get top recruits to come to Connecticut, no matter what conference they are in and despite their recent troubles both on and off the court. Allen and other alumni said they also think it’s important the school settle its dispute with Ollie, who played point guard for the Huskies in the 1990s before becoming an assistant under Calhoun and then taking over as head coach. The school, in outlining why it fired Ollie, cited several recruiting violations, including shooting baskets with a recruit on a visit to campus and arranging a video call between recruits and Allen. Ryan Boatright, the point guard under Ollie on UConn’s 2014 national championship team, said he believes the recent hard times have given UConn players and fans another chip on their shoulders. Posted in New Britain Herald, UConn on Wednesday, 15 August 2018 20:01. Updated: Wednesday, 15 August 2018 20:04.